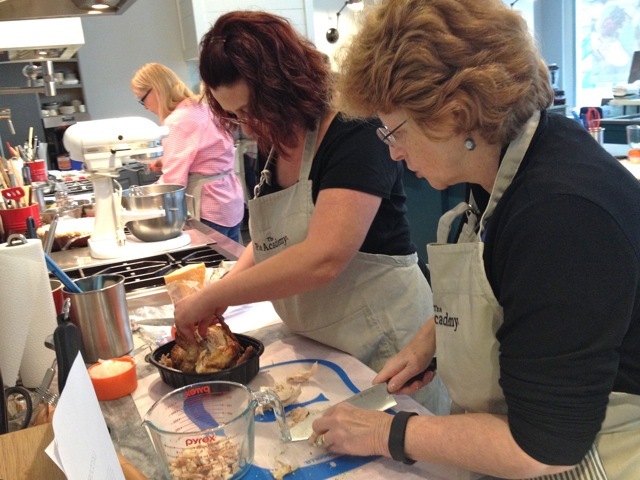 The Pie Academy’s 2015 Lowcountry Pie Getaway in Charleston, SC – here’s how it went down. 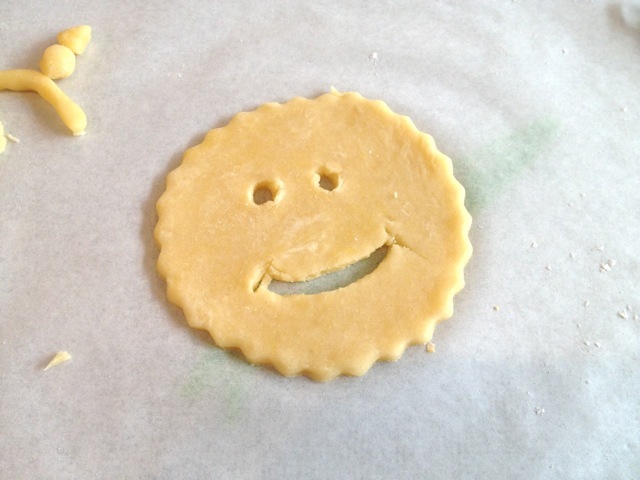 Julia seems to be pretty happy with the look of her buttermilk pie dough. 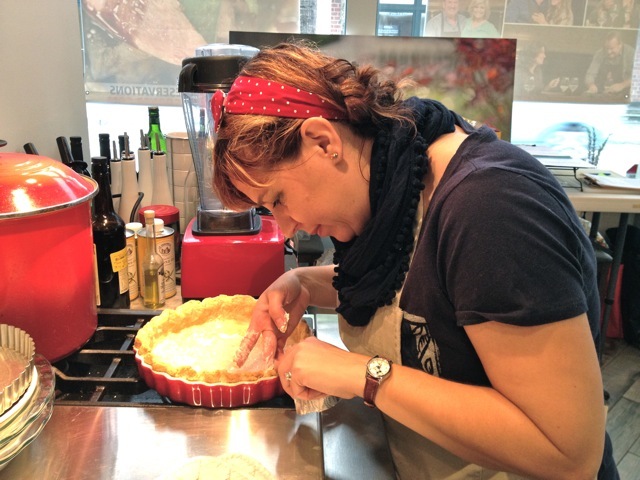 When I started The Pie Academy several years ago, my goal was to create an active online community of passionate pie makers with whom I could share pie making tips, recipes, advice, and information about pie making tools…both in print and with online video. 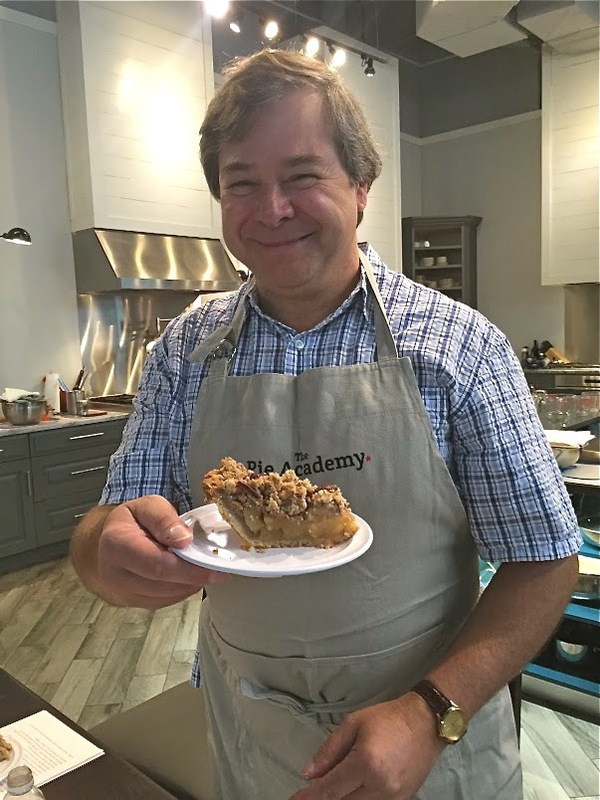 But as time went by and our community grew, it became clear that there was a real interest – both on my part and from Pie Academy members – in taking this a step further and coming together, in the flesh, to celebrate and to hone our passion for pies. 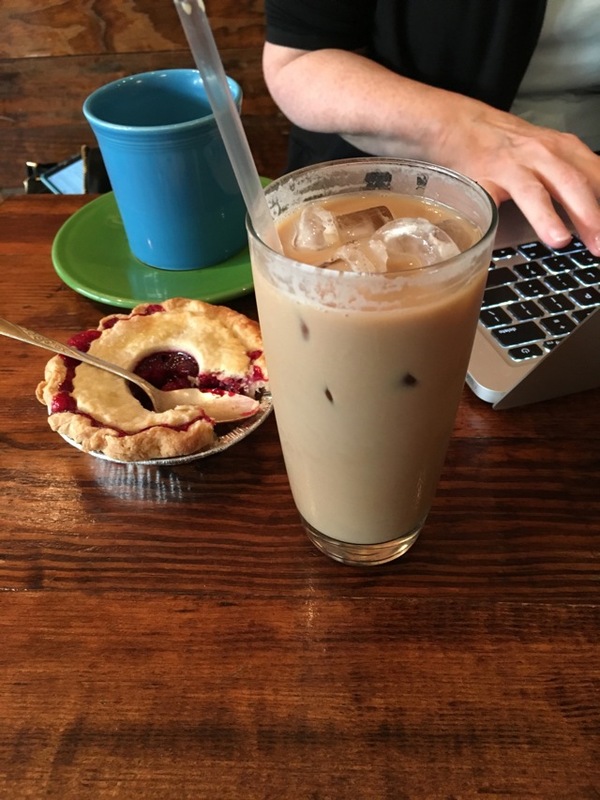 That’s when the idea for The Lowcountry Pie Getaway was hatched, our first being held in October of 2014 in Savannah, Georgia. Nick was back again this year and his pie making skills were on steroids. It was a fabulous event, and difficult to imagine that we could top that experience. Still, we would do our best to up our game and make the venue and the experience even better next time. 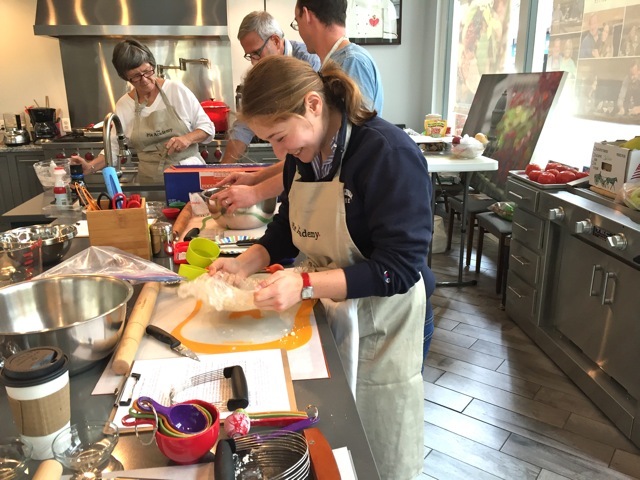 We set our sights on what many believe to be America’s most gracious and beautiful city, and picked a host venue to rival the best equipped cooking schools in the country. 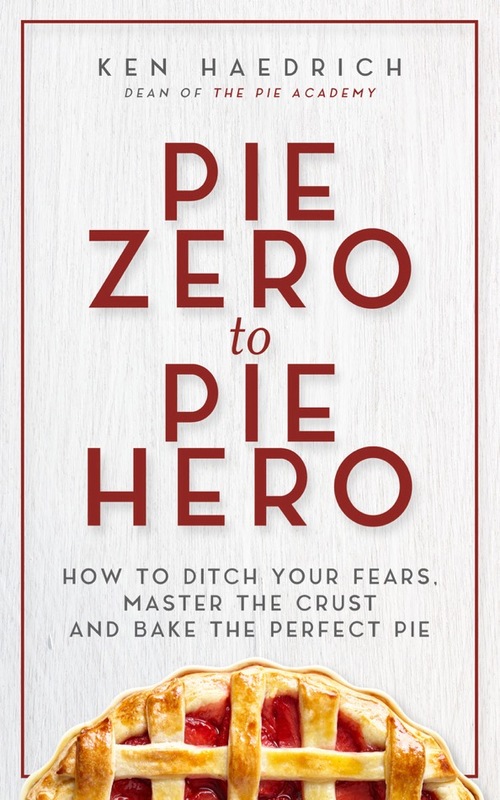 Finally, we designed a pie-centric curriculum that we thought would excite accomplished pie makers and entice novices, too. Dave’s cutout top crust apple pie was beautifully executed. After months of planning, it all came together last week in Charleston, South Carolina at the 2nd Annual Lowcountry Pie Getaway. And I’m happy to tell you that we hit a home run. Liz (foreground) rolls out her pie shell while Deb contemplates her next move. You can never know what to expect when you bring together a dozen strangers. But when those twelve happen to be kindred pie spirits, I can vouch for the fact that the “stranger” thing is short lived and quickly replaced by an enduring camaraderie and sense of community. 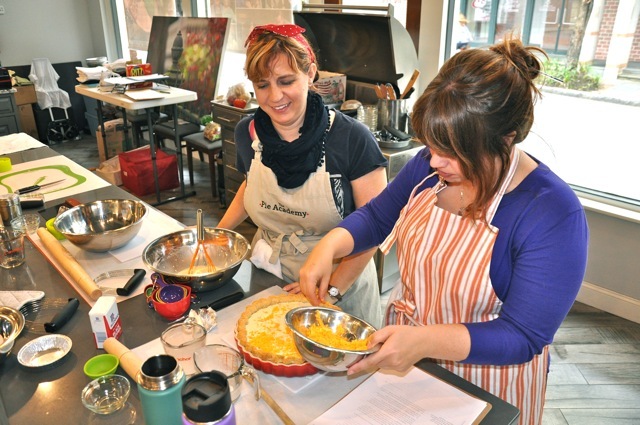 Megan and Shelby putting the finishing touches on their smoked salmon quiche. 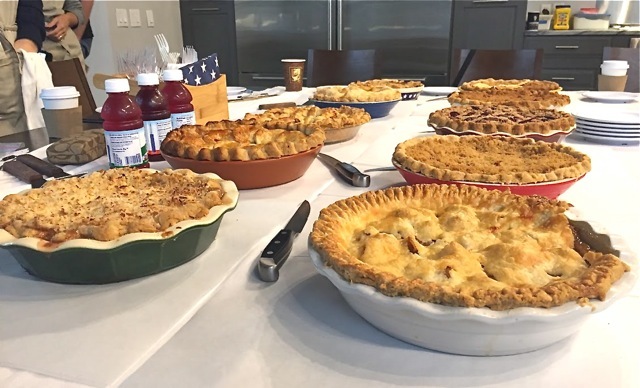 We planned an ambitious curriculum for the weekend, dividing our time equally between sweet – apple pies and mini cranberry-cherry pies – and savory pastries, with two-person teams making and baking either a quiche, savory galette, or hand pies. 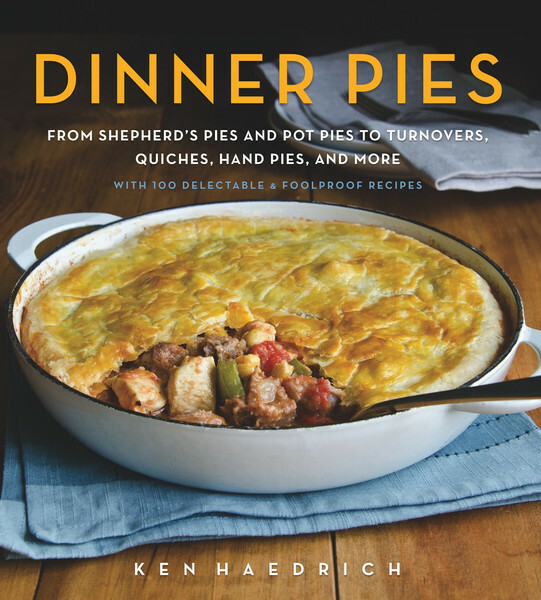 Not only did the savory pies give us something to eat for lunch each day; they were also an opportunity to feature some of the recipes from my new book, Dinner Pies, out just this week in hardcover. Dave cutting up beef for he and Deb’s Cornish meat pies. We made a variety of crusts for a variety of purposes – an all-purpose buttermilk pie dough I’ve been perfecting; a sturdy hand pie pastry from Dinner Pies; a Crisco crust for a session on making crust the way grandma used to; and a short, cookie-style crust for the sweet mini fruit pies we baked. Deb and Dave assembling their meat pies. They were delicious! Deb and Dave anxiously await their Cornish meat pies. 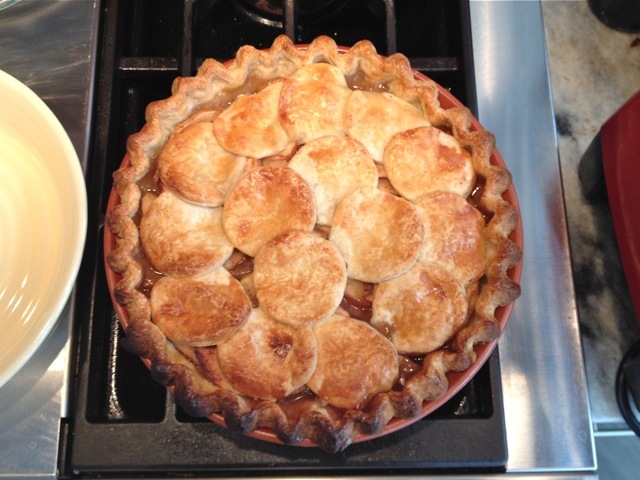 Ginny takes a bite of her apple crumb pie – her first pie ever! We were so proud of her. 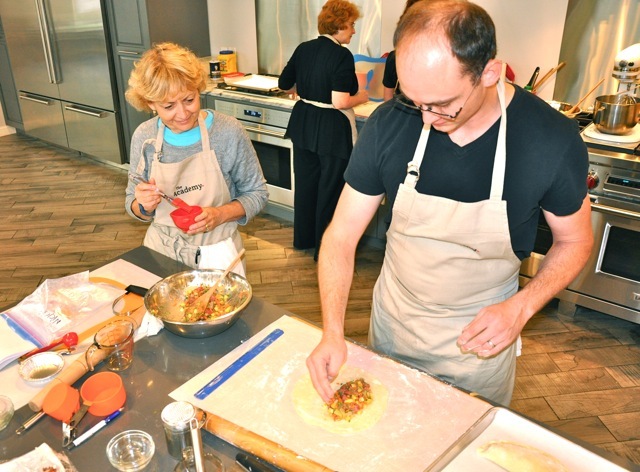 We did our best at the Getaway to duplicate real life pie making and mimic the steps we would take at home, like making our dough ahead and then giving it time to rest and refrigerate. While the dough chilled, we’d move on to the next task like prepping our filling ingredients, or tidying up, or snapping photos of our handiwork. Multiply all that activity times ten pie makers, and you’ll begin to appreciate what a swirling beehive of energy we experienced all weekend. Susan and Janet going to town on their Chicken, Broccoli and Cheddar Turnovers from Dinner Pies. Indeed, all this energy kept me on my toes and challenged my abilities as a pie making instructor. 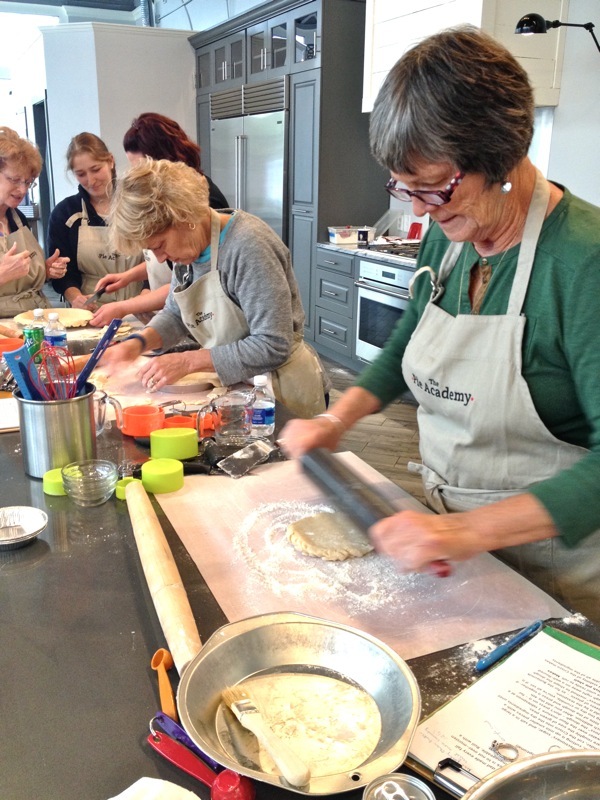 Imagine, if you will, ten folks making food processor pastry at one time…rolling out dough…getting it into the pan. 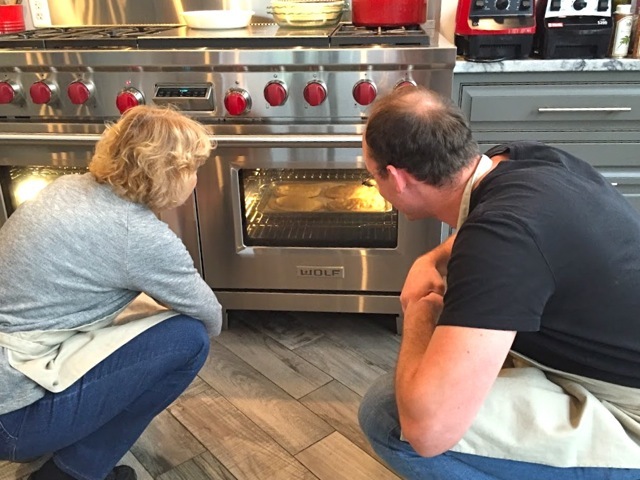 It was, at times, a handful to manage, but I was not alone: one of the most gratifying things I witnessed at the Getaway was the more experienced attendees lending a hand or giving a helpful hint to another less practiced baker. I loved seeing that. 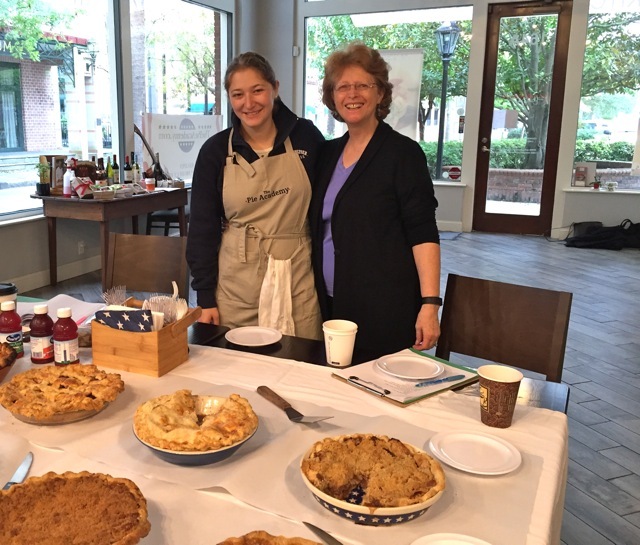 The proud daughter-mother pie making team – Julia and Janet. And I also loved that a number of the attendees used the Getaway as an occasion to kindle their bonds. There was the delightful mother and daughter team of Julia and Janet, above. Longtime friends Ginny and Liz shared the experience together, as did best friends Megan and Shelby, who reunited with Nick and Susan, their new friends from last year’s Getaway. It’s not a stretch to say that it felt, at times, like a family reunion. Me, applying an egg glaze to a tomato and cheese galette. Susan, Dave, and Ginny look on. Come to lunch! 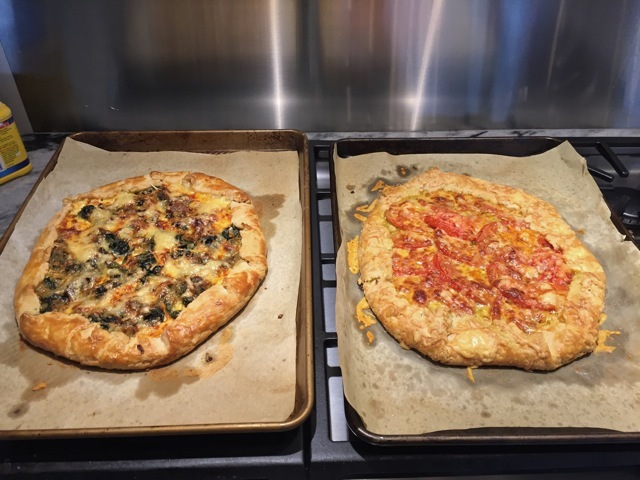 Swiss chard and tomato galettes. 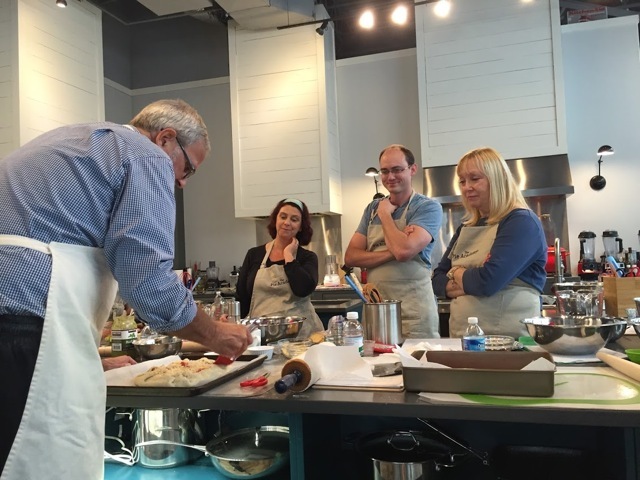 There aren’t a lot of places that could have afforded us the fabulous workspace and level of intimacy as our host venue did – Chef Bob Waggoner’s new studio kitchen and cooking school on Market Street, just off King Street. Megan applying some cream cheese “putty” to her quiche shell, to prevent leaks. Even with ten pie makers we had plenty of counter space, more ovens than we needed, and enough cooking gear to outfit a battalion of cooks. All of this, on a well traveled street where tourists, locals, and horse-drawn carriages paraded by all day long. 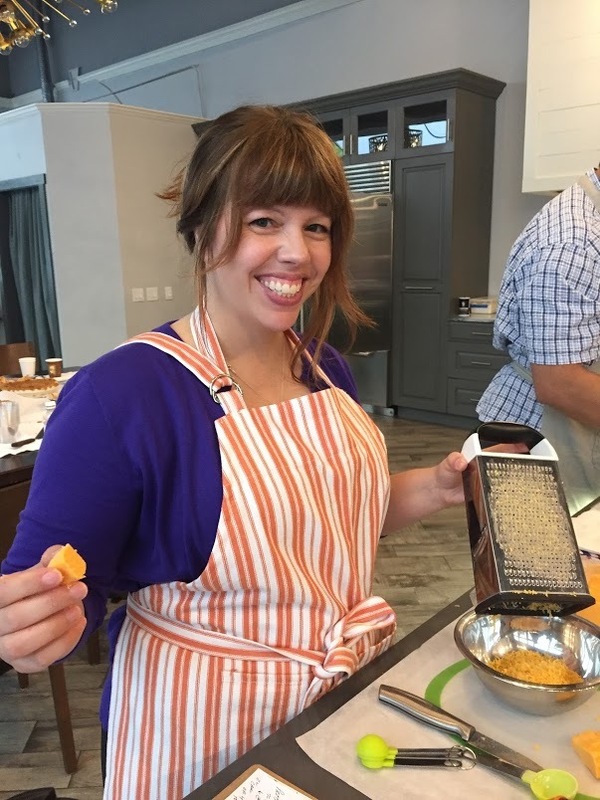 Shelby getting cheesy at The Pie Academy’s Lowcountry Pie Getaway in Charleston. Incidentally, Chef Bob’s kitchen has turned into one of the hottest tickets in town, so do look him up the next time you’re in Charleston. 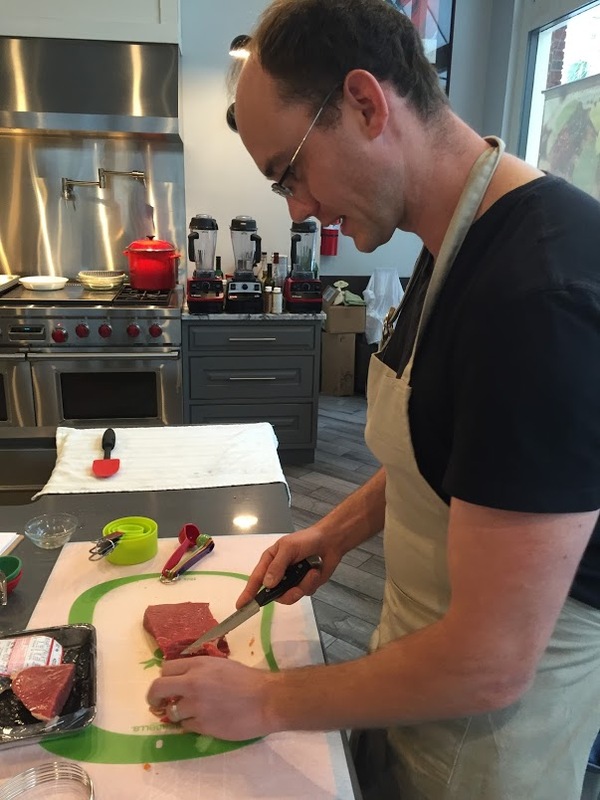 Like he did for us at the end of the event, he’ll put together a meal for your group – showcasing his unique fusion of Lowcountry and French cuisines – that you won’t soon forget. When it comes to gifting your pies, there’s nothing like the right box to make it extra special. As the Getaway began to wind down, my wife Bev gave a short presentation on how we like to package small pies, pie slices, and whole pies for gift giving. Using the boxes we sell in The Pie Academy Online Store, she showed off her tricks for adorning pie boxes with festive flourishes for the holidays, birthdays, baby and wedding showers, and other special occasions. 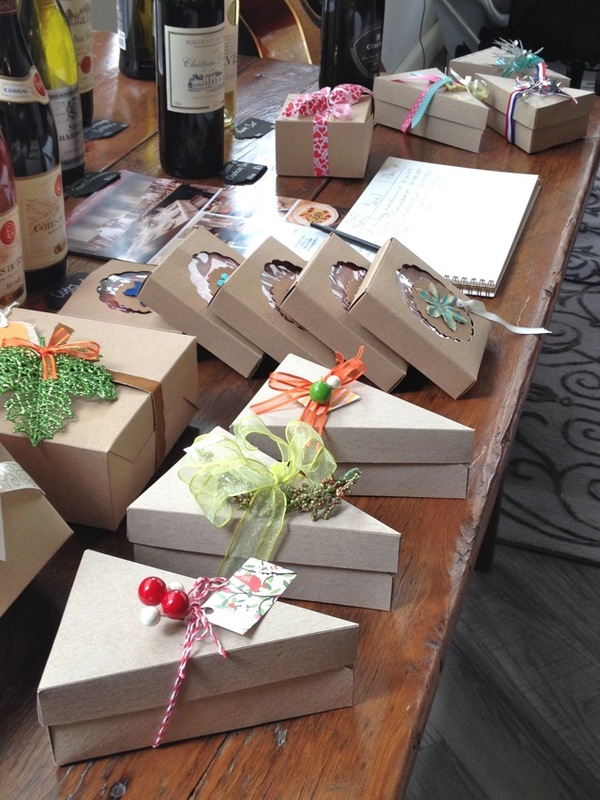 Everyone loved the idea of using our pie boxes for what Bev calls “bread and butter” gifts, a little slice or two of pie to thank a hostess. They’re a thoughtful way, too, for the hostess to send off her guests with a slice of something special. 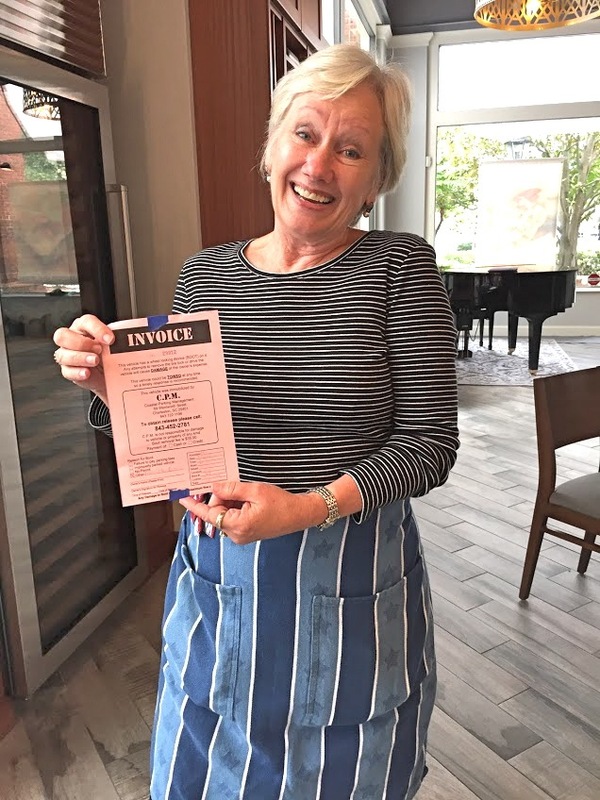 Bev almost got the boot during the Pie Getaway; here she is with the citation she managed to talk her way out of. 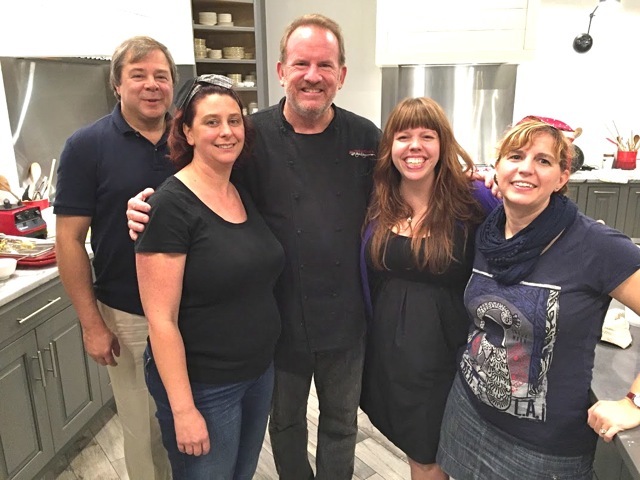 Chef Bob (center) hugging it up with Nick, Susan, Shelby, and Megan. So here it is, one week post event, and we’ve rested just long enough to start thinking about the next Pie Getaway. Frankly, we’re not sure yet where next fall’s event will be held, but we’re always open to suggestions. It could be Charleston again. But it has to be an appealing location that folks will want to visit. 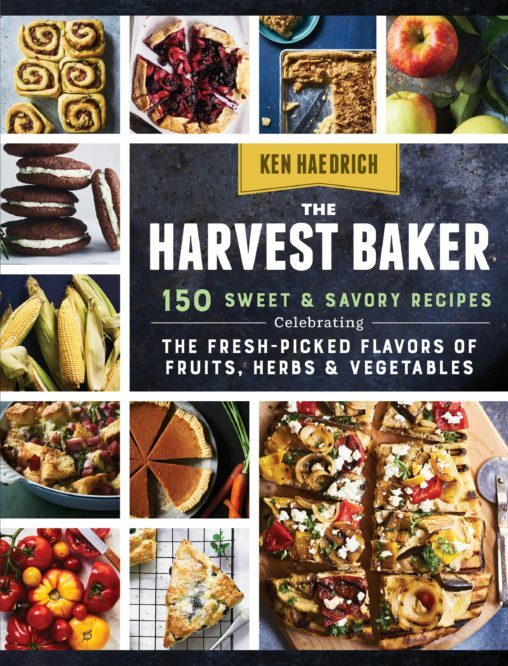 And – just as important – the host facility should be able to accommodate at least 15 and possibly more bakers – the number we expect next year. If you have a place in mind, let us know. Wherever it is, we hope to see you there! 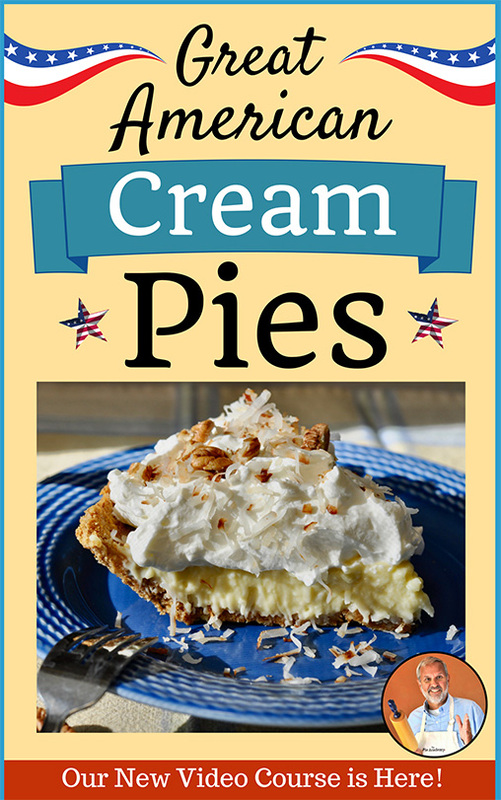 PS – Please share the link to this story if you know anyone who might enjoy it, particularly someone who might like to come to our next Lowcountry Pie Getaway. Thanks! 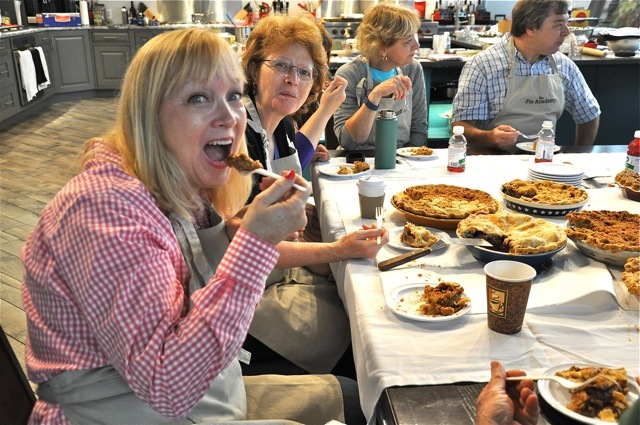 -The local Charleston newspaper – The Post and Courier – stopped by to see what all the pie making action was about. Here’s their story.